This book is no longer available on the web. It is now an updated published volume. 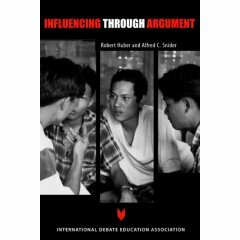 A text for citizens, students and teachers of forensics, and debaters of all types, INFLUENCING THROUGH ARGUMENT introduces readers to the basic types of arguments—induction, deduction, and causation—and explains how to criticize and engage them. Readers will learn how to support their arguments and evaluate their opponents using historical data, statistics, examples, anecdotes, expert testimony, and common experience. They will also learn how to prepare for and conduct themselves in argumentative situations, including debates, panel discussions, public speeches and informal settings. The original 1964 text has been updated and filled with new examples and activities. Robert Huber was the Edwin W. Lawrence Professor of Forensics at the University of Vermont for 40 years prior to his death in 1996. He won national championships and was recognized as one of the most important figures in speech communication in America during the 20th century. Alfred Snider is the Edwin W. Lawrence Professor of Forensics at the University of Vermont and the Director of the World Debate Institute. A debate educator for 35 years, he is recognized for his theoretical (game theory as a paradigm for competitive debate) as well as his practical (textbooks, manuals, debate.uvm.edu website) contributions to the field. He has conducted debate training in over a dozen countries. He has received the Glenn Pelham Coaching Award, the George Zeigelmueller Coaching Award, and the Don Brownlee Award for service to debate. You can acquire this book at Amazon.com. For bulk orders, contact MGreenwald@sorosny.org.